The owner of Payless Furniture Store in Lawrence, Kansas has shuttered his business with a bang, sending his version of the middle finger to all of the residents he profited from once. Lawrence Journal-World took some photos of his fond goodbye to Lawrence. The one at the top faces the street. Yes, you're reading that right. 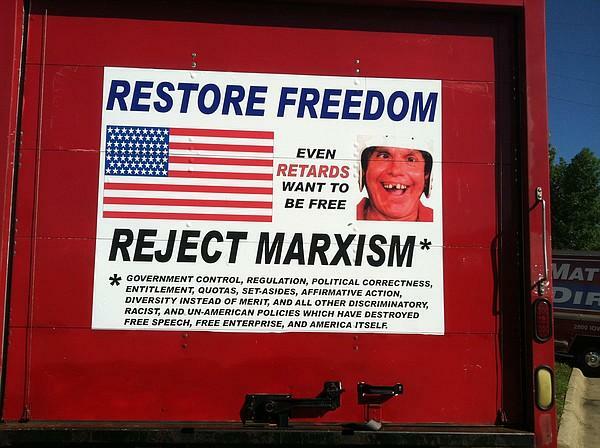 It really does say "Even retards want to be free." Lawrence is one of the areas of Kansas that voted for Obama in 2008 and 2012 and is comprised of college students and middle class families for the most part. * Evidently Payless owner Robert Fyfe resents his customer base so much that he's just leaving. His customers don't care much for him, either. This review from November 1, 2014 says he's "a rude offensive bigot." The reviewer goes on to say that he went on a rant about Lawrence and Kansas University, because they have "the highest percentage of *** people in the state". Another reviewer describes an incident where Fyfe "started ranting about black people (he used the n word) ruining Kansas..." Evidently Fyfe felt that it was fine to talk to this customer that way, because he was white. Here's an ad from 2007 featuring Fyfe as the "Sofa King"
And they wonder what's the matter with Kansas? *Corrected description of Lawrence's populace.